Fellow to the American Academy for the Advancement of Science, Professor Emeritus William A. Tiller, of Stanford University’s Department of Materials Science, spent 34 years in academia after 9 years as an advisory physicist with the Westinghouse Research Laboratories. 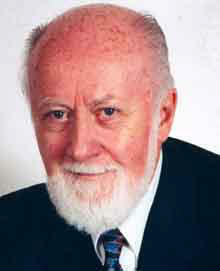 He has published over 250 conventional scientific papers, 3 books and several patents. In parallel, for over 30 years, he has been avocationally pursuing serious experimental and theoretical study of the field of psychoenergetics which will very likely become an integral part of “tomorrow’s” physics. In this new area, he has published an additional 100 scientific papers and four seminal books. We humans are much more than we think we are and Psychoenergetic Science continues to expand the proof of it. Psychoenergetic Science involves the expansion of traditional science to include human consciousness and human intention as capable of significantly affecting both the properties of materials (non-living and living) and what we call “physical reality.” For the last four hundred years, an unstated assumption of science is that such a thing is impossible. However, our experimental research of the past decade shows that, for today’s world and under the right conditions, this assumption is no longer correct. We have discovered that it is possible to make a significant change in the properties of a material substance by consciously holding a clear intention to do so. For example, we have repeatedly been able to change the acid/alkaline balance (pH) in a vessel of water either up or down, without adding chemicals to the water, merely by creating an intention to do so. While this is very exciting – even more exciting is the fact that we have been able to use a simple electronic device to “store” a specific intention within its electric circuit. This is important because this “intention programmed” device (we call it an intention-host device), can be placed next to a vessel of water at any physical location to obtain the same results we have achieved in our lab. In this way, we have had others replicate these water pH results at multiple locations around the world. Such results are consistently reproducible! How is it possible for something like this to occur in the physical reality with which we are all so familiar? We have discovered that there are actually two levels of physical reality and not just one. It is this “new” level of physical reality that can be significantly influenced by human intention! How? There are two basic kinds of unique substances found in these two levels of physical reality. They appear to interpenetrate each other but, normally, they do not interact with each other. We call this the uncoupled state of physical reality. In the uncoupled state we are able detect our normal physical environment with our five physical senses. But the substance in this normal state of physical reality is not influenced by human intention. The substance in the “new” level of physical reality, appears to function in the empty space between the fundamental electric particles that make up our normal electric atoms and molecules. As such, it is currently invisible to us and to our traditional measurement instruments. But the substance in this “new” level is influenced by human intention. The use of intention-host devices affects both realities in such a way that meaningful coupling begins to occur between these two very different kinds of substance, and therefore, between these two levels of physical reality. Then, the “new” level of physical reality becomes partially visible to our traditional measurement instruments. We call this condition the coupled state of physical reality. In the coupled state, we can measurably influence physical reality via intention. The implication of all of this for our world is enormous! Our experimental research suggests that implementation of the technologies we are pioneering will have profound impact on all aspects of human endeavor. Improved methods for converting fossil fuels to mechanical energy, more powerful computing capabilities and greatly enhanced potential for human mental and physical development are just a few examples of the dramatic possibilities. Learn more about this remarkable research with the Introduction To Intention Host Device Research DVD! Filed Under: ARCHIVES, Guests Tagged With: Dr. William Teller, psychoenergetics, What the Bleep do we know?